1986-02-20. Good. Ships with Tracking Number! INTERNATIONAL WORLDWIDE Shipping available. May not contain Access Codes or Supplements. May be ex-library. Shipping & Handling by region. Buy with confidence, excellent customer service! 1986-07-05. Good. Ships with Tracking Number! INTERNATIONAL WORLDWIDE Shipping available. May not contain Access Codes or Supplements. May be ex-library. Shipping & Handling by region. Buy with confidence, excellent customer service! 1985-05-30. Good. Ships with Tracking Number! INTERNATIONAL WORLDWIDE Shipping available. May not contain Access Codes or Supplements. May be ex-library. Shipping & Handling by region. Buy with confidence, excellent customer service! Dutton Adult, 1985-05-30. Hardcover. Used:Good. Penguin Books. PAPERBACK. 0140087966 New Condition. . New. Dutton Adult. Hardcover. 0917657306 New Condition. . New. 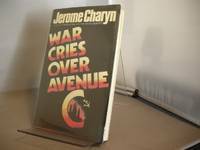 WAR CRIES OVER AVENUE C.
New York:: Donald I. Fine, Inc.,, (1985). Fine in fine dust jacket.. First printing. Novel set in the "Alphabet Blocks" - Avenues A, B. C and D - back in the days when those were "Indian country" - the land of murder and cocaine. INSCRIBED on the half title page to the late Oklahoma book collector, Larry Owens. 359 pp. New York: Donald I.Fine, Inc.. Fine in Fine dust jacket. 1985. First Edition; First Printing. Hardcover. A Fine first printing of the first edition in alike dust-jacket; . Dutton Adult. Hardcover. 0917657306 Like New Condition. . Fine. Penguin Books. PAPERBACK. 0140087966 Like New Condition. . Fine. New York: Donald I. Fine, 1985. Fine/Near Fine. First edition. Uncorrected Proof. Fine in wrappers, in a near fine proof dustwrapper with a short tear to the crown of the spine. New York, NY, U.S.A.: Donald I. Fine, Inc., 1985. Blue paper on boards, red cloth on spine. Some very light soiling pages ends. Jacket is rubbed front and rear panels. Now in clear cover. "Here is a tale of the Wild Wild East, Manhattan's Indian country. The alphabet avenues from A to D, where there are no gods, where the cops wear batman capes as a message to snipers that they're not on patrol. Presiding over Alphabetville is Saigon Sarah, the tiger lady of Avenue C. War Cries over Avenue C is an American story from the bottom up, from the inside out, a harrowing, and comic, saga that grabs with its narrative force, impales with its wit and imagination, and never lets go as it squeezes the juices, however dark and poisonous, from the best - and worst - of us all. . First Edition. Hard Cover. Very Good/Very Good. NY: Donald I. Fine. (1985). The uncorrected proof copy. Fine in wrappers, in a near fine proof dust jacket. First Edition. Softcover. Fine. New York: Donald Fine, 1985. Cloth and boards. First edition. Review copy with material laid in. Fine in dust jacket. Dutton Adult. Used - Good. Good condition. Good dust jacket. New York:: Dutton Adult. Cloth. 0917657306 8vo. 359 pp. With review slip, promo, and photo. . Fine. 1985.. First edition. New York: Donald I. Fine, Inc.. Very Good. 1985. First Edition; First Printing. Softcover. An Uncorrected Proof in red wrappers, issued in pictorial dust jacket. Light wear to the bottom page edges. .
Penguin (Non-Classics), 1986-07-01. Paperback. Good. New York: Donald I Fine, 1985. Book. Near Fine. Hardcover. First Edition. Dutton Adult, 1985-05-30. Hardcover. Good. Donald Fine. 1st printing,1985. Very Good/Very Good hard cover. 8vo,boards,359pp. edgewear,nicks,small bubble foot corner front,dust jacket. light shelfwear. edges yellowed. clean and tight text. shelfved in fiction. Penguin Publishing Group, 1986. Paperback. Good. Disclaimer:A copy that has been read, but remains in clean condition. All pages are intact, and the cover is intact. The spine may show signs of wear. Pages can include limited notes and highlighting, and the copy can include previous owner inscriptions. At ThriftBooks, our motto is: Read More, Spend Less.Dust jacket quality is not guaranteed. New York, NY: Penguin Books. Good;. 1986. Reprint. Trade Size Paperback. 0140087966 . 8vo - 8" to 9" tall; 359 pages; White trade size paperback lightly rubbed at edges. Remainder mark. Text pages clean and tight. .
Dutton Adult. Used - Good. Ships from Reno, NV. Former Library book. Shows some signs of wear, and may have some markings on the inside. 100% Money Back Guarantee. Shipped to over one million happy customers. Your purchase benefits world literacy! Dutton Adult. Hardcover. 0917657306 Good Condition. Has foxing. Five star seller - Buy with confidence! . Good. London: Abacus, 1986 An ex-library copy of this book but in good condition. No creases to the covers or to the spine. 359 firm pages. ffep missing. neat withdrawn stamp. London. : Abacus., 1986. 359pp.. Paperback. Very Good. 8vo - over 7¾" - 9¾" tall. Seller: N. G. Lawrie Books. Dutton Adult. Hardcover. GOOD. Spine creases, wear to binding and pages from reading. May contain limited notes, underlining or highlighting that does affect the text. Possible ex library copy, thatâll have the markings and stickers associated from the library. Accessories such as CD, codes, toys, may not be included.